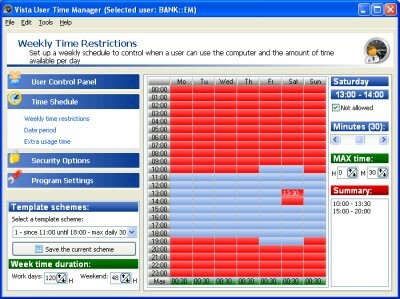 User Time Administrator 3.6.1.1 is access control software developed by 1st Security Software Center. User Time Administrator lets you specify when exactly and how long the computer can be used and define users which will be allowed to use the computer without any limits. You can schedule time intervals and the number of hours each child can use the computer per day a week. It automatically logs your child out of their computer when it's time for lights out. Also you can prevent the PC usage until the specified date and after the specified date. This security & privacy software is shareware, which means you can download and use User Time Administrator 3.6.1.1 for free during the trial period (usually for 30 days). At the expiration of the period you will have to buy the access control product for $24.95. User Time Administrator 3.6.1.1 is available at regnow and 1st Security Software Center website. User Time Administrator 3.6.1.1 supports different languages (including English). It works with Windows 98/XP/Vista. Latest User Time Administrator 3.6.1.1 does not contain any spyware and/or advertise modules, allowing installing it with no worries concerning valuable information loss. Our website has thoroughly tested security & privacy product User Time Administrator 3.6.1.1, written the review and uploaded installation file (1500K) to our fast server. Downloading User Time Administrator 3.6.1.1 will take minute if you use fast ADSL connection.